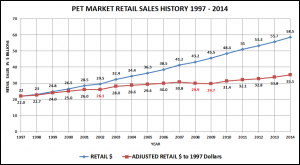 Pet Market Growth – How much is “real”? – Part 3 – The bottom line. 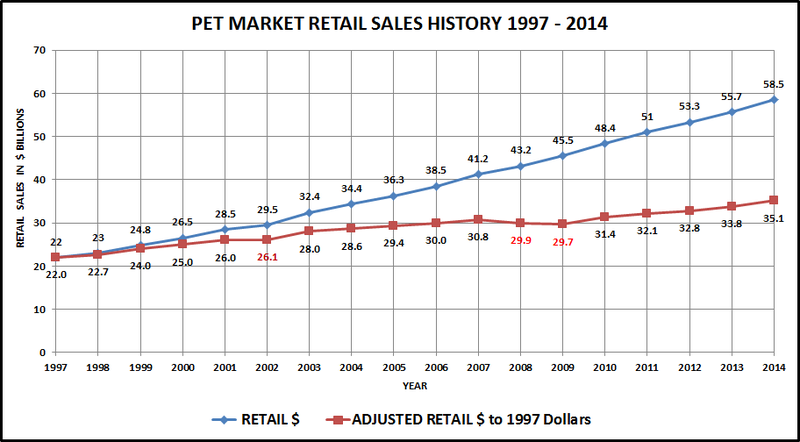 The Retail Pet Market has grown from $22B in 1997 to $58.5B in 2014 – a 165.9% increase. At the same time prices in the industry have gone up 66.8%. How do you factor out the price increases to show the growth in terms of the actual amount of goods and services sold? 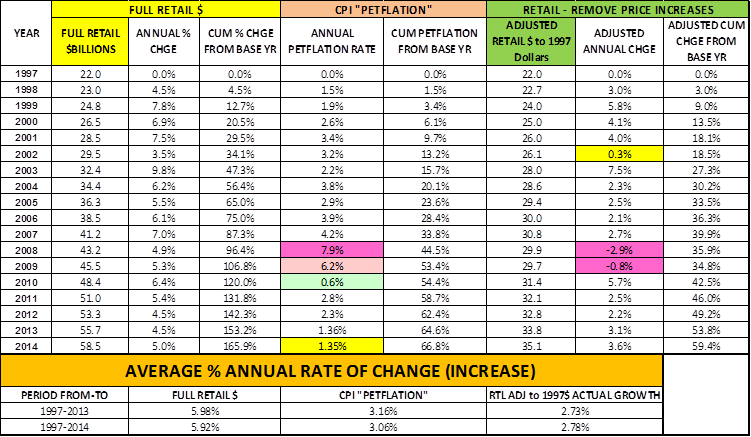 One way is to use the CPI published by the USBLS to adjust each year’s retail sales back to 1997 ($) Dollars (the base year). A lot of details! We can refer back to this chart to reference specifics. Let’s look at the Bottom Line in a more visually friendly way. Pets and Supplies have only increased by 14% in 17 years. Retail Sales went up in 2008 but Consumers BOUGHT LESS – they just paid more. Retail Sales also increased in 2009 but Consumers BOUGHT EVEN LESS – paid even more. The consumers respond with renewed purchasing vigor. Adjusted growth rate is the largest in 7 years and the third largest in the 17 year period. 2011 > 2014 – Service prices continue to go up rapidly but Food price increases come back to a more reasonable rate. Supply prices stabilize and even fall further. Price increases now represent less than half of the average annual growth %. So… “How much of the growth is real?” Obviously, in terms of full retail dollars, the growth is all real. You can take it to the bank. However, more than 50% of the average annual growth has come from price increases, not from increased sales of goods and services. The resulting price adjusted annual growth rate of 2.8% still indicates a moderately strong Pet Market. It should also be noted that like other markets, Pet does have price sensitivity. While Retail Sales have increased every year, large price increases in the Recession years resulted in consumers buying less – usually not a good plan for long term growth. The good news is that they have responded positively to subsequent price drops and a continuing moderate rate of increase in the CPI. Of concern is the continued high rate of price increases in the Veterinary Segment. When will the consumer react? 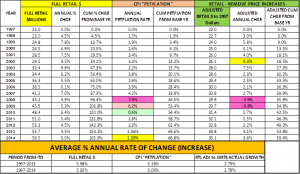 On the other end of the spectrum, will deflation continue in the Supplies Segment. This will put added pressure on manufacturers. In our next post we will begin a detailed look at the period from 2009 to 2014. This recent history has the most relevance to the continued growth of the market .